It’s Sunday, SUNDAY! Woohoo! I dunno why I’m so excited, it’s going to be a long day because my husband has to work all day (Sundays are usually his day off). But, I’ll try to be cheerful anyway. 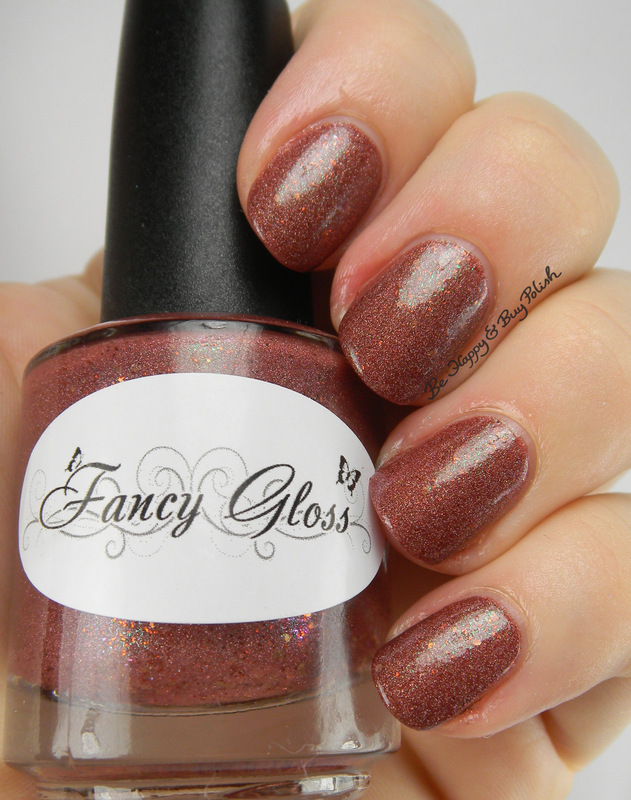 But today I want to show you a Fancy Gloss polish I picked up awhile back: Prototype 12. Prototype 12 has a reddish brown base with orange red flakes and green shimmer. It also has a scattered holographic effect. This is 2 coats and no top coat. This is fairly unique to my collection, I don’t think I have another like it. This is no longer available on Fancy Gloss’ website, though. Sorry! Lola’s Secret Beauty Blog: If you are look for a foolproof and easy-breezy way to contour, then PÜR Cameo Contour Sticks are just what you have been looking for. They have a creamy consistency, and they come with their own high quality blending sponges! I Know all the Words: What’s blue and green and a little bit awesome? My new hair featuring Colour Oops, Splat, and Manic Panic. Never Say Die Beauty: Allison from Never Say Die Beauty has put together a sweet Valentine’s look using the adorable Too Faced Chocolate Bon Bons eyeshadow palette. Swatches included! Beauty by Miss L: My new favourite beauty gadget – PMD Personal Microderm home microdermabrasian system device! Color Me So Crazy: StriVectin has an ALL-IN-ONE and YOU need to learn more…. Collective Beauty: A romantic and affordable Valentine’s Day makeup look! Makeup Obsessed Mom: Chapstick has come a long way baby! Check out Stacie’s post on the iconic brand. It looks like a nice color!